Designer Jewelry - This is an original sculptural sterling silver ring beautifully handcrafted featuring two round blue Turquoise cabochons (8mm each). The ring is wide in the front with one cabochon set at each end. 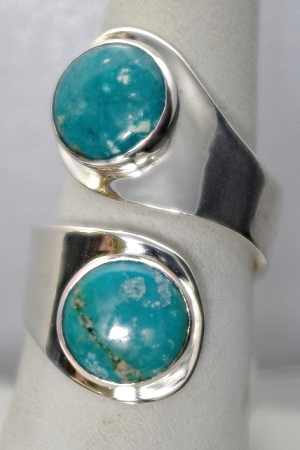 A sterling silver sculptural ring with two round turquoise stones. The rings is adjustable to meet any size.